Brainwashed - Drew McDowall, "The Third Helix"
Drew McDowall, "The Third Helix"
The trajectory of Drew McDowall’s recent resurgence as a solo artist continues to be a compelling and unpredictable one, as The Third Helix is quite a bit different from either of his previous Dais outings. If Collapse felt like a lost Coil session and Unnatural Channel felt like a vintage noise tape, Helix feels like the assimilation of those two sides into something more forward-looking and unique. It does not quite unseat Collapse as my favorite of McDowall's albums, but a couple of pieces easily rank among his finest work to date. More importantly, the album as a whole cumulatively casts a wonderfully immersive and disorienting spell that is ideal for headphone listening. This is the first of McDowall's albums that makes me feel like he is currently in the midst of a fresh new creative phase rather than merely unearthing and reworking a deep backlog of unreleased material. The opening "Rhizome" embodies a curious dichotomy that runs throughout The Third Helix, as McDowall seems equally drawn to both sublime beauty and collapsing, distended ruin. Those two sides rarely come together elsewhere on the album, but they certainly do on "Rhizome," making it the strongest and most instantly gratifying piece on the album. While it deceptively begins with a disjointed series of warmly shuddering string flourishes adrift in a haze of slow-motion synth swells, the piece soon coheres into a recognizable structure…then unexpectedly blossoms into rapturous swirl of choral voices and achingly beautiful strings. Once he hits that wonderful crescendo, however, McDowall immediately sets about dismantling it and the piece dissolves into a clanging and buzzing industrial coda. The Third Helix never quite delves into such naked and unambiguous beauty ever again, but it does feature at least one another piece of similar caliber, as the densely throbbing and see-sawing "Impulse" gradually transforms into a lysergically heavy feast of rattling drones and garbled voices. It manages to evoke a mood that is best described as "nightmarishly beautiful," resembling a simple string piece that has been stretched and smeared into lurching horror. I also quite like "Nothing is Hidden," which sounds somewhat similar, yet excises everything organic or melodic to leave only a shambling, hissing, and grinding mechanized hellscape. Interestingly, the album's brief closer "Immanent Condition" goes in completely the opposite direction, unfolding as a quietly melodic synth theme that merely frays at the edges rather than completely corrode and collapse. The rest of the album takes a much more subtle and willfully destructive approach though, as the appeal lies less in the strength of the motifs and the compositions than it does in how McDowall plays with time and pulls everything apart to weave a fragmented and kaleidoscopic fantasia. I have no idea how much of that strategy was premeditated, but it definitely seems like McDowall had enough strong ideas for only half an album and ingeniously opted to use the second half to mangle and manipulate his lesser ideas in interesting ways. In some cases, such as the excellent "Proximity," it is easy to see the ghost of a fully formed idea driving the churning and heaving abstraction. In most of the other cases, however, the degree to which McDowall succeeds is directly related to how closely I am listening to how things break apart. For example, "YLL" feels like a very simple pattern that has been reduced to a creeping granular ooze. Elsewhere, "Tendrils" is a quietly pretty ambient piece drifting through a reverberant ruin of stomping and clattering machinery, though it eventually loses its way and seems to morph into a completely different piece altogether. The remaining piece, "False Memory," is a bit of a fascinating outlier, as collaborator James K's vocals swoon and slide in a bleary haze over an unpredictably throbbing and jackhammering backdrop. The prominent presence of vocals is an obvious departure for McDowall, but it is equally significant that he completely abandons his usual pattern-manipulation for something more unpredictable and organic. I like it, but it sounds like it belongs on a completely different album or possibly in some kind of avant-garde theater mindfuck. If The Third Helix has a weakness, it is mostly that some of the more fragmented and deconstructed pieces are too insubstantial to make a real impact on their own or linger in my memory after they are gone. Also, a strong appreciation for nuance, texture, and detail is quite helpful in unlocking the full depth of McDowall's artistry, as the straining seams, falling detritus, and sluggishly hallucinatory timescale play a crucial role in elevating several of these pieces into something much more compelling than is immediately obvious. 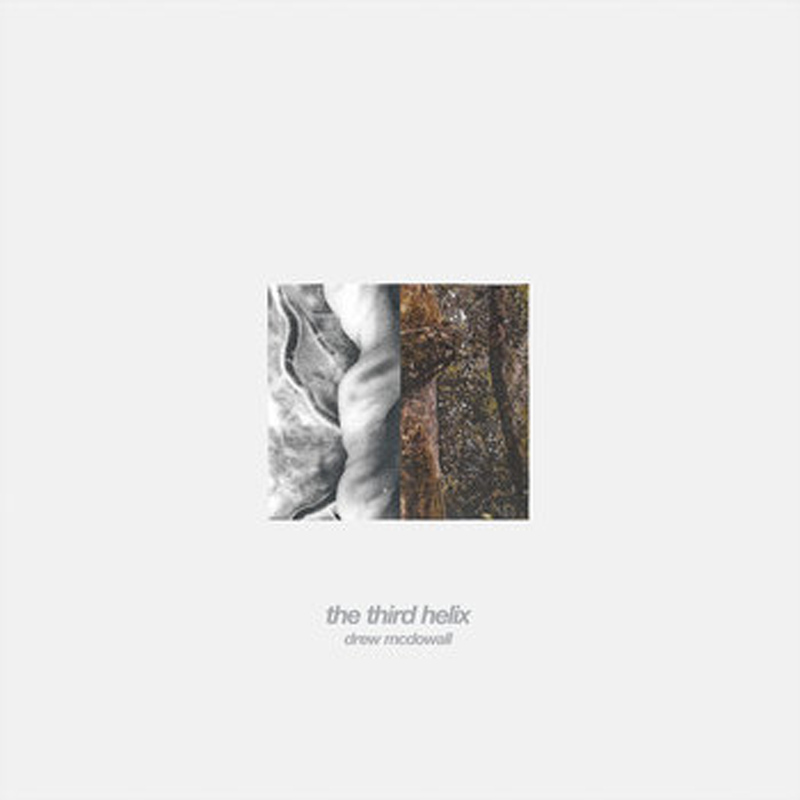 The Third Helix would probably be a more unambiguously fine album if it featured a better balance between melody/harmony and clattering post-industrial experimentation, yet it still feels like a significant step forward to me, as McDowall has found a novel way to work around his limitations. He has always been much better at coming up with great ideas than he has been at building those ideas into strong compositions with a satisfying arc. With this new approach to time-stretching, however, McDowall manages to drag and strain even the simplest ideas into song-like durations. If that was all he managed to do, it would not be much of an achievement, but almost every one of those distended and broken fragments plays a significant role in the assembly of a slow-burning, coherent, and wonderfully warped and dreamlike whole. Samples can be found here.